I just returned from the Wednesday Farmers’ Market where I pick up our CSA share every other week, so I’m in the right frame of mind to tell you a little about Local Flavors by Deborah Madison. For this book, she visited farmers’ markets all across the US, including Hawaii, to see the differences from place to place. The chapters are, for the most part, organized by season starting with early spring and proceeding through fall. So, the first chapter’s recipes highlight what you’re likely to find at markets at the beginning of the year. There are stories strewn about that tell of Madison’s visits to various markets and the farmers she met. She offers suggestions for substitutions for regional things that might not be found in all areas of the country or that become available at different times. The real goal of the book is to encourage support of local farmers, to explain the value of fresh, local food, and to inspire the home cook to make good and delicious use of locally grown food. As luck would have it, Russ Parsons of the LA Times wrote about cooking with farmers’ market produce today too. He wrote about improvising with what you find and suggested "Cooking from the farmers’ market is a bit like playing jazz." Last week, I mentioned having a lot of greens on hand, and when I saw this recipe in the book I knew it would be a great way to use some of them. 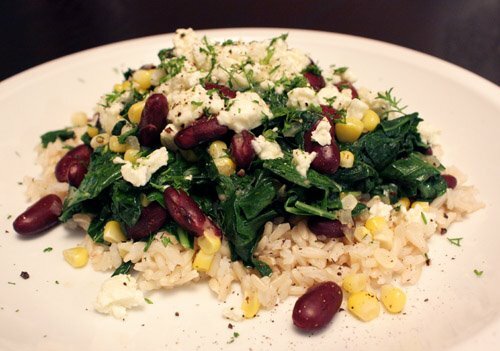 It’s listed in the book as redbor kale with red beans, cilantro, and feta cheese. I had spinach and what I think was broccoli greens, and any kind of greens would be good here. One of the interesting points that Madison makes in the book is that by buying at farmers’ markets, you have the chance to get the same vegetables at multiple stages. When a planting needs to be thinned, the greens may be cut and sold earlier in the season. When the vegetable is growing, you may be able to buy small versions of it, and then you’ll later see the mature state for sale. I’m not sure if the greens were offered because of thinning or not, but it’s interesting to think about the growing season and being involved in it in some small way. So, I had planned this for dinner the other night, and while out picking up the feta, I found some Texas-grown corn. I love fresh corn. I had an inkling that it might be a nice addition to this dish, and adding another locally grown item definitely seemed to be in the spirit of the book. I cheated a little and used canned beans, so I skipped the part of the recipe about cooking red beans. I also skipped the part about boiling the greens because I find it so much simpler, and more flavorful, to saute them. So, I cleaned and chopped the greens, sauteed them with finely chopped onion and the last of my homegrown cilantro, and then I added some water and the rinsed and drained canned beans. I cut kernels from two ears of fresh corn and added that as well. This was left to simmer for about 10 minutes, and then I served it with brown rice and a nicely pungent sheep’s feta crumbled on top. I like greens with beans, and the cilantro added nice flavor. But, and I really don’t mean to pat myself on the back here because I’d rather pat the person’s back who grew the corn, that fresh corn made the dish. I highly recommend seeking out the freshest, local corn and greens you can find when they’re available and giving this a try. If you’re curious about what’s available at the Austin Farmers’ Market at this time of year, today my CSA pick up included: zucchini big and small, baby yellow summer squash, onions, red beets with gorgeous greens, baby leeks, orange carrots with leafy tops, watermelon radishes, tiny, baby green cabbages, and a red cabbage. Also at the market, there were some first of season tomatoes, and a some tomatoes that had been greenhouse grown, cucumbers, green beans, some other summer squashes, arugula, and potatoes. Other vendors offer locally made cheeses, grass-fed beef, bison, lamb, chicken, and eggs, and I know I’m probably forgetting several other things like the delicious-looking bread. For dinner tonight, I’m going to blanch some of those perfect green beans and then toss them in a leek vinaigrette with chopped cucumber and tomato. That’s getting topped with leftover sheep’s feta. yum. yum. yum. this looks fantastic! i am entering veggie/summer mode and this is perfect--thanks. This looks so beautiful and refreshing. Feta makes everything taste so good. Thanks for sharing! This looks so healthy and delicious! I try to make at least one vegetarian meal a week, so this is definitely going on the menu soon. 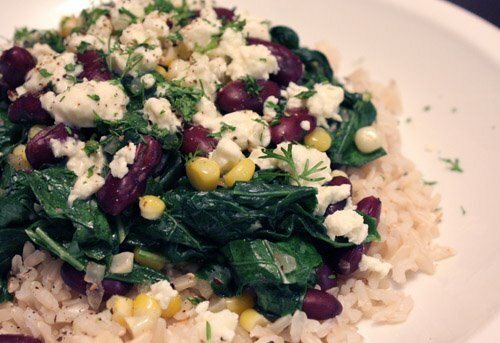 Lovely greens - perfect with feta cheese and rice! I just love the feta cheese on there...just POPS! Delicious and healthy, perfect meal for weekday, then on the weekend we all can splurge on special meal, right? MMMMM....indeed, a delicious, wel balanced & lovely meal! Yum! this is so all over the culinary planet I dont know what it reminds me of - something greekysouthwesternmediteranean - or something like that. beans, corn, and cilantro are my favorite tex-mex-type ingredients, so i'm thrilled to see them in a different sort of dish. this looks completely appetizing, lisa--bravo! I love multi-bean salads, they're so filling and nutritous! The cheese here must balance the sweetness of the corn really well. It looks great! Looks absolutely delicious and healthy. I love that Deborah Madison! You are so lucky to have that abundance in your market now. We are just seeing the first of the asparagus and radishes in the great wet North. It looks absolutely delicious! I love the greens usage. We've never seen the greens/rice combo before. This would be good eats right now. I wish I would have thought of writing a book like that. How much fun would that be to travel all over to different farmers markets? Your dish looks so good. I love that it looks so easy to make! I love the combination of all these ingredients together. This sounds so rich in flavor. I love the addition of cheese here. Pretty fresh colors. i restocked my feta today, so something like this could be my lunch tomorrow with brown rice. i agree with sauteing the greens as opposed to boiling, they taste way better. This looks incredible. I can't believe how much I've come to love healthy food, and it's because of dishes like this. Since you won't do it, I will - pats on the back! We must be on the same wavelength. I made bulgar with feta, Japanese cucumbers, asparagus, parsley, and preserved lemons last night. Feta is definitely in the air. What a great flavor combination! I especially like the feta on top! Lovely ideas of using Feta and a great dish for Spring. Very inspirational! what a wonderful yummy dish - this looks fantastastic. Looks so nice-it's like a one dish meal!! Each component is delicious but together, they make such a perfect dish! Yum! This looks so so yummy! Love everything in it! MMmmm looks delightful! I'm so happy that the farmers markets are starting to get stocked with things other than tubers and apples:-) Tender early season corn is also great raw.